Jean Pickering passed away peacefully on March 25th, 2013 at the age of 83. 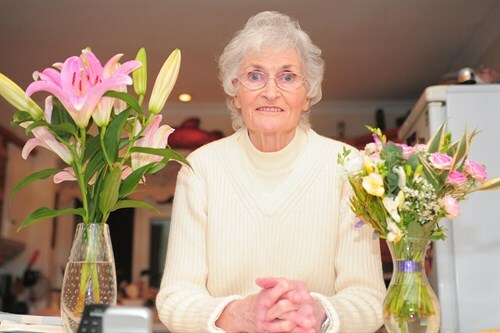 Jean had been struggling with her health for the past few years, but had set herself a goal of staying around long enough to be there at the London 2012 Olympic Games in her home town of Stratford. She was there to witness “Super Saturday” and to watch so many of the athletes that we had supported through the Ron Pickering Memorial Fund over the previous 21 years since Ron’s passing. She had worked tirelessly to keep Ron’s ideals and name alive through the Fund and what it stood for and was so proud of all the athletes that it had helped. The Fund shall continue now in honour of both Ron and Jean, and the huge contribution that they had both made to the Sport of Athletics throughout their lives. She will be missed by so many people whose lives she touched. 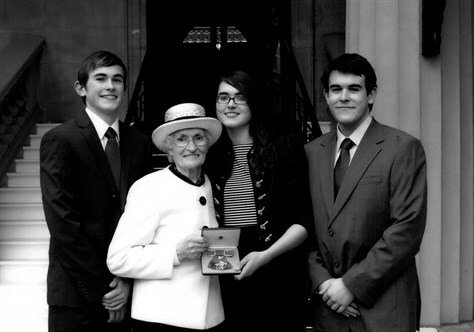 Jean being awarded the Freedom of the City of London by Lady Victoria Leatham. Missed 1948 Olympics through illness. 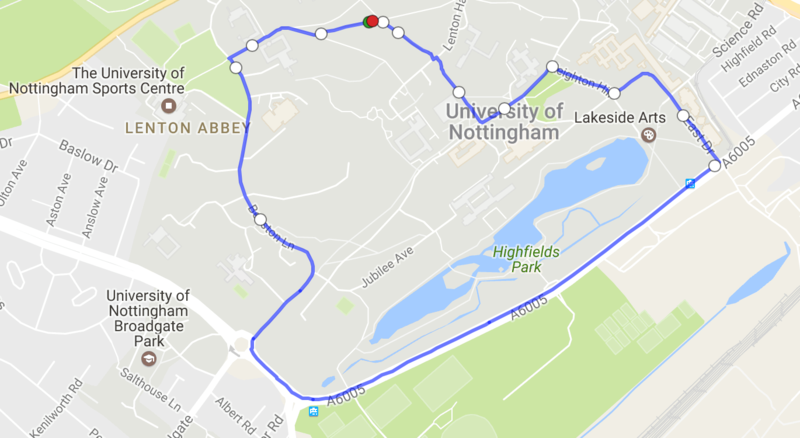 1952 Olympic Games – 5th Hurdles, Bronze medal 4 x 100m Relay. During career, Jean was British Champion at 80m Hurdles (5), Long Jump (2) and Pentathlon (2) and Women’s team captain in 1953 and 1954. Only British athlete so far to win a European Gold medal on the track and in the field. In 1954, married Ron Pickering who at that time was a P.E. teacher at StratfordGrammar School where they had first met as pupils. 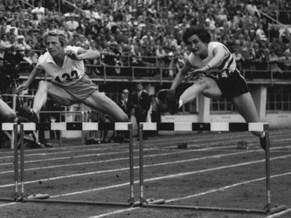 This effectively ended Jean’s competitive career but as Ron progressed from teacher to National Athletics Coach for Wales, coaching Lynn Davies to an Olympic Gold Medal, and then as a BBC Sports Commentator, their lives were inextricably linked with athletics and its many competitors not only from Britain but from around the world. Ron was awarded the OBE in 1986 for Services to Athletics. After his untimely death in 1991, Ron’s voice was missed within the sport but it gave a platform for Jean to set up a charity in his memory. Twenty-one years later thanks to money raised mainly on the London Marathon each year, his Memorial Fund has supported thousands of talented young athletes, some of their coaches, athletic clubs and associations at grass roots level. Many young athletes have gained international selection and some have gone on to win Olympic and World Championship medals. The Ron Pickering Memorial Fund has given out over £1.3 Million in grants so far and nowadays the athletes supported make up over 75% of GB Track & Field teams. 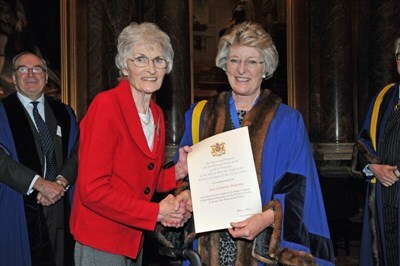 Jean was awarded the MBE in 2010 for Services to Athletics and the Ron Pickering Memorial Fund. With the 2012 Olympic Games awarded to the East End of London, Ron and Jean’s lives have come full circle. Only a mile away from where Jean learned to hurdle in a school corridor through a lack of sports facilities at StratfordGrammar School, the youth of the country will now inherit an Olympic Park that will inspire them and help them to realise their own sporting dreams. Jean with Fanny Blankers Koen, Helsinki 1952. Jean seemed virtually indestructible and I always felt she would be able to keep going– it is so pleasing that when the time came it was at home…. And, post 2012, she got the chance to see those home games which was a massive goal for her. For my part I have never come across anyone who has matched her commitment to help out athletes– regardless of ability– and so humble when doing it too…As the years have passed I might even say she has had a bigger impact on the Sport than even Ron. Very sad news to hear Jean Pickering passed away, without her help my Olympic and European medals would not have been possible. 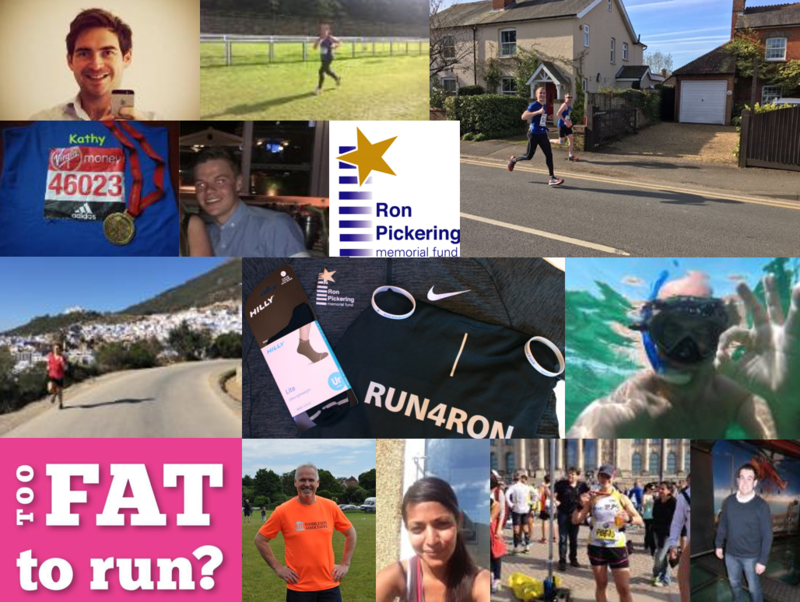 Many of the sports heroes have been very fortunate to have benefited from the Ron Pickering Memorial Fund, including me, and that support played a fundamental contribution in helping kick start my career at the junior GB age group. I will always be thankful for the support and have huge admiration of Jean’s relentless drive and determination to give the next generation a chance to shine! I have no doubt that Ron and Jean’s legacy will continue to help the next generation! A wonderful lady. I am grateful for her efforts and the help she provided me with through the fund. She was a wonderful lady and she will be sadly missed by many and especially the young athletes her life touched on a personal level, and through the Ron Pickering trust. Her legacy I am sure will go on and she will be remembered in a happy way. I just want to say how sorry I am to hear about Jean and how it has been a privileged to be recognised by her from such a young age and supported by her my whole career. Jean has always been and will always be the mother of British Athletics and she was an inspiration, staying so passionate through the highs and lows, I can’t image how proud you are to have a mum like that. It is with great sadness that we have received the news of your mother’s death. To us she was a very precious person and all her friends at Sportshall will feel a great loss. She had been our President for 22 years maintaining the Pickering connection from our beginnings in 1976. Her untiring service to our sport was outstanding, she was loved by everyone and we are all very proud of the huge contribution she has given to athletics with such passion and devotion. I’m just 1 of many athletes who Jean Pickering influenced/helped as a young athlete. She was like Ron, a remarkable individual, who touched and changed so many lives with her selfless dedication to young peoples’ lives through Ron’s memorial fund. The Youth Charter celebrates its Twentieth anniversary this year. Jeans early conversations with me, many years ago, greatly helped the agency develop, when detractors saw it only as pipe dream . As I was the very first grant recipient and living proof of how through Ron and Jeans ideals of how sport can give you opportunities in life I am blessed to have met both of them. Fortunately I had a good catch up with Jean earlier this month for a good half hour phone chat putting the world to rights and her still telling me how proud she is of me with my new venture. She will be sadly missed! So sad to hear about the passing of Jean Pickering. An inspiration in the greatest sense of the word. An absolute hero!How about every athlete who has been helped by RPMF pay back what they were awarded to help the next generation? She’d love it. From me personally, and on behalf of London Schools Athletic Association, I would like to say RIP Jean, and thank you. My deepest sympathies for your loss, and sincere regret for the loss of a stalwart who believed strongly in fair play. I am truly saddened to learn of the death of your mother, however you can be rightfully proud that you have the sort of parents many would envy, with such respected views and commitment to athletes who themselves are prepared to apply themselves to sport. RIP Jean, amazing woman. Will never forget you helping me buy my first high jump spikes. Thank you. What a great soul she has, always open, friendly and with an infectious sense of humour. Fond memories we keep in our hearts…1976 we had just come out of Saudi Arabia with 2 year old Corey and 9year old Marni. Pete had gone on to Montreal and darling Jean opened your home to us. That bonded our friendship for the many years that followed. My last trip over was in 2010…we watched BBC shows together, walked the little village, dined with Kim and her great family, and quietly anticipated a “nice little dinner” that Shaun had planned for her 80th birthday. I had to leave that very day to meet my performing choir in Vienna. How I wished I could have stayed for the big surprise evening Shaun had planned! She was so surprised! It was a highlight of her life! She made the world a better place for so many people. I will always remember Jean smiling as she always found time with me to have a chat and the same for everyone else. I have fond memories of tea and cake at your house as a teenager and it was all those times that helped me become the person I am today. Jean was a wonderful person and athlete in her time and her great commitment to help young people in athletics with the Ron Pickering Fund was second to none as she had a vision to help others which was honest and hard working toward the sport. Jean was my hero and I loved her because she always made me feel special and had time for me always.. I will really miss her and the sport will miss her because she really really cared. I will never forget her kindness and her smile. She meant a lot to me. To many, your mum was a saint and I would count myself as one of those. Your Dad was one of the most supportive people that I have ever met, in fact probably will ever meet and alongside every good man is an even greater woman – your mum, for undoubtedly she cared dearly for people and it showed in all the time that she spent trying to help. It was those little touches that I will remember her for. Those little messages and smiles that meant so much at the time and forever. Absolutely devastated to hear of Jean’s passing. What a fantastic woman, I’m so glad I got to be one of the athletes she supported. Carole and I were so sorry to hear of Jean’s passing. In particular I have known her for a long time – I used to kid Ron that I probably knew her before he did, as I trained at Victoria Park alongside her in the late 40s, early 50s. Happily I was in Helsinki in 1952 to cheer her Olympic relay bronze, and then in Berne in 1954 to watch her long jump victory. She was a lovely lady and will be greatly missed. A firm memory is when she and your dad so kindly invited us round for the evening when they heard that Carole was so upset by her mother’s death in 1976. Unfortunately that was the evening when Ross McWhirter was assassinated by the IRA, and Ron was besieged by the media for comments. They both will remain in our hearts for as long as we are allowed. My heart goes out for the sad loss of Jean… She and Ron touched and supported so many people like myself and we are truly grateful. 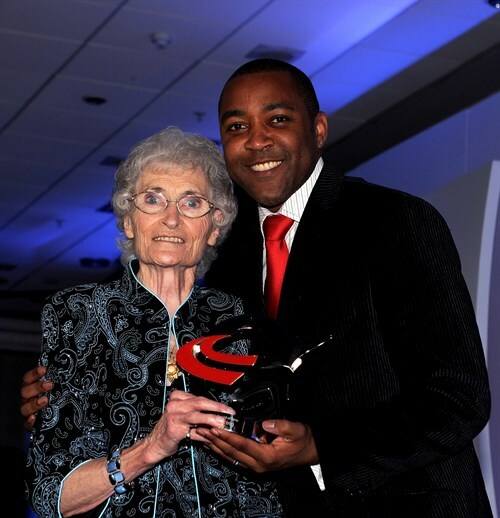 I was always honoured to be in the presence of Jean – her genuine warmth and passion for athletics always shone through. Both Jean and Ron will always remain in my heart and mind! She was an amazing lady, she was like a mum to me when I was growing up, she taught me how to cook and how to knit! Essential life skills! She’ll never be forgotten. RIP Jean Pickering. You will always be remembered as The Godmother of our Sport. What a truly remarkable woman you have always been and your love and unswerving enthusiasm for the welfare and well being of our youngsters will always shine strong. The RPMF supported me so much when I was a young athlete and continues to support the athletes that I now coach! Few people have made such a huge difference to the sport in this country as Jean did. It’s only fitting that she was there to witness the London 2012 Olympics, having helped so many of the home successes at the Games. The many, many hours of joy that the Pickering fund enabled me to have as a youngster by helping to fund me participate and train in the wonderful sport of athletics, will never be forgotten. Many, many thanks to the Pickering’s for their wonderful work; I hope and plan to spread the wonderful enjoyment of life that the Pickering fund helped me to find.